Jeremy Stoppelman's Blog: Book Report: Work Hard. Be Nice. Book Report: Work Hard. Be Nice. 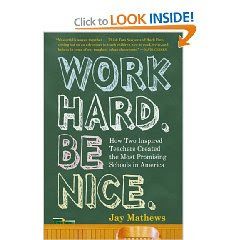 Another good book on some of the positive change now happening in the world of education. Jay Mathews tells the story of the founding and success of KIPP (Knowledge is Power Program) charter schools. Started in Houston about 15 years ago by two Teach for America teachers (Levin and Feinberg) the program has since grown to 66 schools in 19 states. KIPP has had considerable success boosting test scores and hence college preparedness of kids from underprivileged backgrounds. Perhaps the most important takeaway is that change is not easy. Overcoming bureaucratic sclerosis (both in the world of education and most certainly anywhere else an old guard exists) is a serious challenge no matter how good your program or idea. In addition, great success also attracts great scrutiny and the book touches on the many probing questions raised by skeptical critics as KIPP schools and it's unique program became more widely known and celebrated. Fortunately, despite significant resistance and opposition KIPP continues to expand and looks poised to transform education for the better. After reading this text and Whatever it Takes I'm quite optimistic that the charter system will be ultimately hailed a roaring success. While there is still a long way to go, the program has clearly fostered creativity and experimentation in education, which was so badly needed.